Jim Blauch, a Pennsylvania native, diligently hooked and rehooked river smallmouth bass and anything else that wanted to bend his pole. The dedication and perseverance displayed there surfaced in the classroom; he has degrees in wildlife management, chemistry, environmental studies, as well as graduate research in environmental biology. Jim is a Federation of Fly Fishers Certified Casting Instructor and affiliated with numerous company Pro-Staff Programs including St Croix Rods. 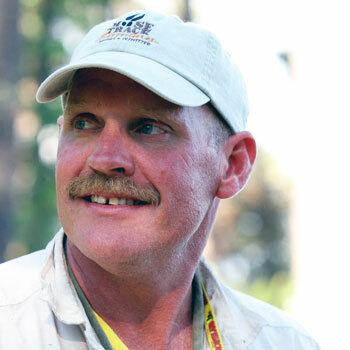 Jim Blauch has guided the Boundary Waters Canoe Area Wilderness in northern Minnesota for the past 20 years. If you want solitude and crazy smallmouth bass fly fishing listen in and Jim will spill the beans on this great destination. Jim's two passions of fishing and exploration eventually led him to Ely, Minnesota at the edge of the Boundary Waters Canoe Area Wilderness. Jim Blauch is the owner/operator of Moose Track Adventures Resort, Outfitters and Guide Service, he is a valuable source of information on the flora and fauna, natural history, and ecosystem ecology of Northern Minnesota. His fabulous fishing and outdoor experiences - wilderness navigation abilities, enjoyable campfire stories and taste bud tantalizing meals are all things his clients enjoy. Jim loves guiding in the Boundary Waters Canoe Area Wilderness, which is not the end-of-the-world but it makes for an end-of-the-world experience at the edge of the civilized world. To learn more about Jim Blauch's guide services, school, flies and DVDs visit his website, www.MooseTrackAdventures.com/.